Pens and pencils – No matter which grade your child will enter, pens and pencils will be on the list. You probably already have plenty of them at home, so double-check your supply before buying more. Lunchbox – Rather than purchasing a “trendy” lunchbox, buy a basic one. When a trend becomes passé or your child outgrows it, you won’t have to replace the lunchbox. Clothing – Before buying new clothes, explore your child’s closet, dresser, shelf tops, under-bed boxes, and other hideaways. You may emerge with some barely worn items, or ideas for new ways to mix-and-match outfits. Combination lock – Make sure that your child’s combination lock for his or her school locker is reusable by keeping the combination code in a safe place. Should your child forget the code during the summer, you’ll know where to find it. 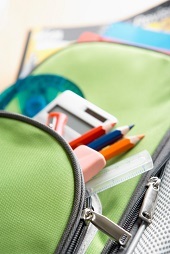 Backpack – One of the most expensive items on school supply lists is also one of the most reusable: the backpack. If your child takes good care of his or hers, it could last for several years. The tips above could help you spend less for school supplies, but if your budget is still tight, remember that great options also exist for free back-to-school supplies.